is a large edge-on lenticular (lens-shaped) galaxy, just northwest of the Southern Pinwheel. 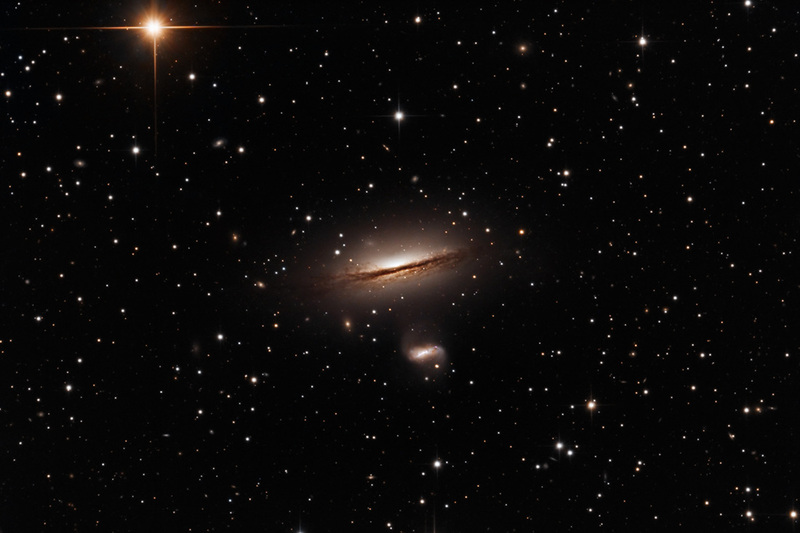 At a distance of 94,000,000 light years from Earth, NGC 5078 has superwinds of gas being ejected in jets. The prominent and obscuring dust lane across its face was likely acquired in a collision with a spiral galaxy long ago. Below the main galaxy is the lovely little IC 879, which unlike its larger neighbor, exhibits the telltale pink of active HII star forming regions. It also has a welcome touch of blue arms in this relatively monochromatic golden field. Note the star bridge that links 879 and 5078. The gravitational interaction between the two galaxies has twisted IC 879 into an 'S' shape, while NGC 5078's dust lane has been warped and widened. This data is from the archive of SSRO.